This article is about the raid battle. For the summon stone, see Grimnir (Summon). 7-hit, large Wind damage to random allies. 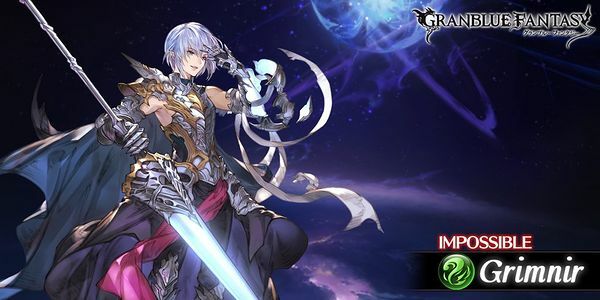 Removes 1 debuff on Grimnir. 2-hit Plain damage to random allies based on 30% of max HP. Big Wind damage to all allies. Normal attacks hit all allies until 50%. Normal attacks now hit one ally. Casts Holy Ray of Purification. 我こそはっ…踊り狂う暴風！グゥrrリィィィィィィムニルゥ…！ It is I... the Dancing Whirlwind! Grrriiiiiiimnir! 我が風は…滅びを齎す My winds... shall bring ruin! 力が…！抑えきれんっ…！ The power...! I can't control it! 右腕が疼く…！ My right hand aches! 狂える風よ！ Be wild, O wind! その胸に刻むがいい Engrave this upon thy heart! 終焉の風が吹く The wind of your demise blows. 天つの槍よ！ The Spear of Heaven! 我が右腕が戒めより解放されし時…天は震え、大地は刻まれ…数多の邪悪が潰えるだろう… Now is the hour for my right hand to be loosed from its proscription... May the heavens tremble, may the earth be cleft asunder, and may myriad evils be exterminated! この一槍…必殺と知れｯ！！ Know this... One thrust of this spear shall cut you down! 我が手で唸る…汝の終焉を With my hand... I shall howl out your demise! カッ！！…カッコいいセリフが浮かばない…！ Gah!! ... I can't think of any cool lines! ちょっ！ちょ、タンマ！ Woah! Hey, time out! なにすんだよぉっ！ What do you think you're doing! 我が颶風に打ち勝つとはな You've overcome my hurricane, it seems. キャラなんて作ってないぞぉ！ I am NOT pretending to be some kind of character!